This large wall bracket provides you with a storage solution for your defibrillator. Giving you the peace of mind that is it being stored safely and effectively, as the contents will be made clear to everyone in the area, ensuring it is not mistaken for anything other than a life-saving defibrillator. After investing time in looking for a defibrillator, it is important to ensure it is kept safe and securely. 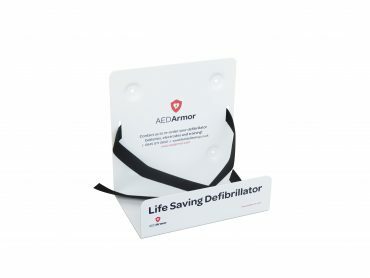 The AED Armor wall bracket will not only safely house your device, it will also ensure bystanders are aware of its contents with ‘Life saving Defibrillator’ clearly marked along the front. Suitable for indoor use only, wall brackets are the ideal storage option for locations such as offices, schools and community centres. By ensuring your defibrillator is safe and available in a wall bracket, it can be easily located and retrieved in an emergency, saving vital time in the case of an emergency situation. If you require further information about the AED Armor Stainless Steel Locked cabinet with heating, please do not hesitate to get in contact with a member of the AED Armor team who will be happy to assist you. Simply call 0330 678 0246 and they’ll be happy to share their knowledge with you.